"The Trump administration is considering adding a tariff of 45% on Chinese products in the hopes of returning manufacturing to U.S. soil to facilitate job growth." In the past four years, there has been a 250% increase in North American manufacturers returning their operations to American soil. A change to this degree has not occurred since the offshore manufacturing trend in the 1990's. 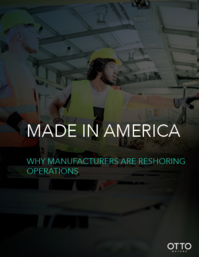 Labor, productivity, quality, and policy changes are forcing manufacturers back onshore to stay competitive and the North American landscape is changing as a result. Learn how these factors create opportunities for your business. This short eBook will teach you why the reshoring movement is happening now, and how it can benefit your business.